When we first embarked on developing our Lease Crude Optimization solution, crude prices were being squeezed but had not yet hit their current lows. Since that time, there have been a lot of predictions about crude prices and about the direction the market is taking. Most of these predictions have been wrong. However, the one thing they all agree on is that crude producers are under a lot of pressure and they are looking for any opportunity to decrease costs. If you are a 1st purchaser or a hauler, you have undoubtedly felt this pressure from producers and are trying to reduce the cost of transporting crude from lease to station. Today, 1st purchasers have to fight for business and show they can offer the best possible price to take crude to market – otherwise, that barrel is going to another 1st purchaser. At capSpire, we recognize these market changes. In fact, the latest addition to our Lease Crude Optimization solution includes a module called Optimal Lease Identification (OLI). OLI is specifically designed to be used by marketers to assist them in determining, out of the vast ocean of leases, which leases are the most profitable and winnable. This is accomplished by comparing their organization’s economics against their competitors’ economics. Attend our free, 45-minute webinar, Crude Supply Optimization to learn more about our solution. 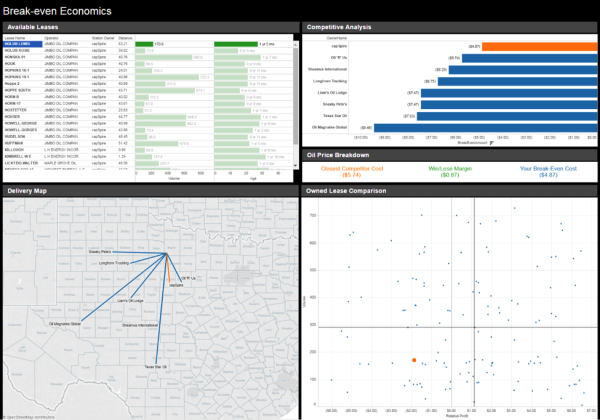 Marketers can capitalize on OLI’s easy-to-use dashboards to determine which leases are most profitable and winnable – and then focus their business-development activities on those leases. Gain an understanding of how Companies embracing innovative data-driven analysis can win big in a complex, competitive market. Register for the Crude Supply Optimization Webinar on Tuesday, March 29th at 12PM CT to learn more. Can’t make it during that time? Register anyway and we’ll email you a recording of the webinar for you to view at your convenience.